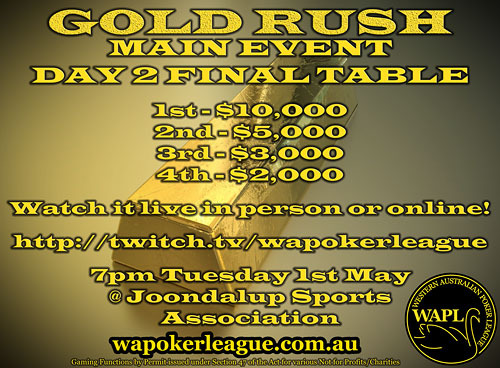 Tuesday - @ Joondalup Sports Association - The Live Streamed FINAL TABLE of the Gold Rush Main Event! 10 players remain, battling it out for a $20,000 Prize Pool, with $10,000 to first! Come watch at the venue from 7pm, or online as we stream it to http://twitch.tv/wapokerleague from the WAPL Live Table! $50 Pro & Free Leagues, Cash Tables & Gold Rush Flips available! Wednesday - NEW VENUE @ Sorrento Football Club! Join our opening night with the 'Gulls'! $50 Pro & Free Leagues, Cash Tables, $2/$5 Live Table, & Gold Rush Flips available! 6pm Registration. Percy Doyle Reserve, Beddi Road, Duncraig.